A striking combination of flavors. Wild garlic is an herb with healing properties and a unique flavor. 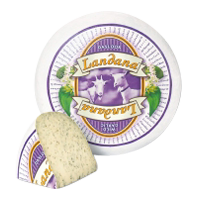 Wild garlic gives this cheese a pleasant taste of garlic, without the less appealing garlic odor. A welcome variation on the cheese platter.